The study of life in past geologic time. is the study of prehistoric life, including the evolution and extinction of species and their associated environments. Paleontologists unite the fields of biology and geology and rely most often upon fossils and the fossil record for their studies. The recognizable remains of past life on Earth, e.g., bones, shells, or leaves, or the traces of such life, e.g., tracks, burrows, or impressions. 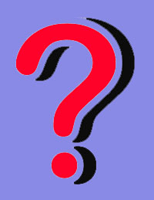 are objects found in the strata of the Earth that are recognizable as the remains of organisms. There are many different types of fossils. Body fossils are remains of the hard parts of an organism such as bones, teeth, claws, shells, or seeds. The soft parts are usually eaten or decay before they can fossilize. 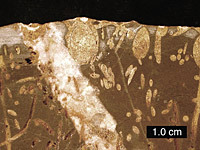 Compression fossils are flattened soft parts such as leaves, feathers, or insects (not shown). Mold fossils are organism-shaped holes or depressions in rock where the body has decayed but the impression remains. Cast fossils form when mold fossils are later filled with minerals that fossilize. The fossilized excrement of animals. (fossilized feces). Unaltered fossils are the remains of whole organisms preserved without decomposition. 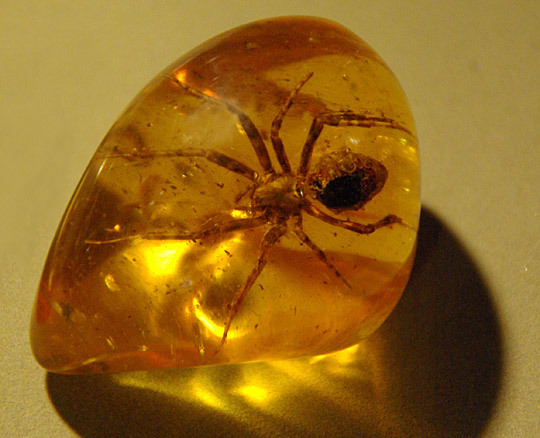 This can occur in ice, acidic peat bogs, or resin such as amber. Chemical fossils are organic molecules that result from the presence of life, such as fossil fuels (not shown). Process by which an organism becomes preserved in layers of the Earth, usually involving burial and/or lithification. is the process of a living organism becoming a fossil. Unfortunately, the series of events for fossilization to successfully occur is rare and only a tiny fraction of the organisms that have ever lived have become fossils. When the organism dies it must be quickly covered by sediment to stop decomposition. The sediment layers are slowly compacted and water is eliminated. The layers are cemented into sedimentary rock. The organic remains are slowly replaced by hard minerals. The totality of fossilized artifacts and their placement within the Earth’s rock strata, which provides information about the history of life on Earth, e.g., what organisms looked like, where and when they lived, how they evolved, etc. is the sequence of fossils as they appear in the geologic strata (layers). By dating the strata, the approximate age of the fossils can be determined. The fossil record preserves the fossils in the order in which they appeared on Earth, providing direct visual evidence of evolution. The strata appear in descending order, thus the deepest strata are the oldest (relative to the present, or the earliest/youngest relative to Earth's history). Due to the complexity of the fossilization process, the more prevalent the species and the longer that it survived, the more likely that it will be represented in the fossil record. Some short-lived species or transitory forms might have never been fossilized and are therefore missing from the fossil record. Their existence however, can be deduced by the fossils of their predecessors and descendants. The variety of species in a sample, community, or area. has varied, from era to era, depending on climate, ice ages, and sea levels, punctuated by periodic mass extinctions (the most serious of which ended the Permian Period with the loss of nearly 60% of then-living bivalves). 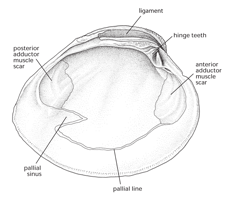 One of usually two large muscles (one anterior, one posterior) that contract to close the shell of a bivalve and maintain it in that condition; the position of these muscles is usually clearly marked on the shell interior as an adductor muscle scar or impression scars. So the Cambrian bivalve is already a well-developed bivalve, and we really don’t know what a “pre-bivalve” ancestor looked like. A tuft of long, tough filaments which are formed in a groove of the foot, and issue from between the valves of certain bivalve mollusks, by which they attach themselves to rocks, etc. threads for attachment to hard surfaces. As a result, by the end of the Ordovician, most of the modern taxonomic groups of bivalves were present, as were nearly all of the ecological types (burrowers, cementers, byssal attachers, etc.) that we recognize today. 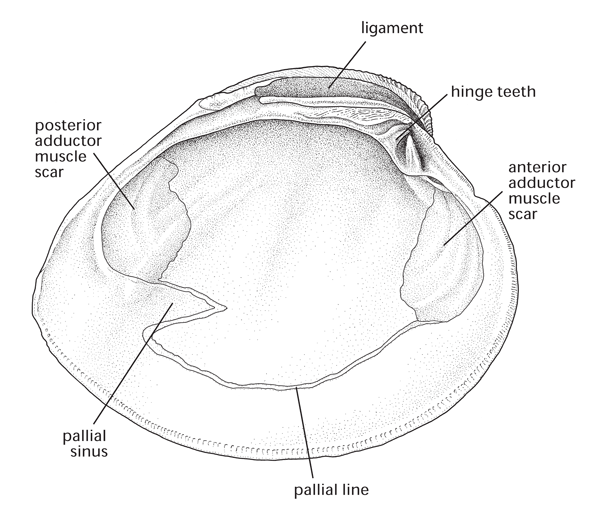 An embayment in the posterior part of the pallial line that indicates the attachment of siphonal retractor muscles and demarcates that part of the mantle cavity into which the siphons can retract in bivalves. 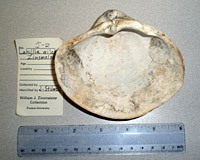 on the inside of the shell; this is the chamber into which a clam retracts its siphons, so any bivalve that has a pallial sinus marked on its shell must have had siphons. 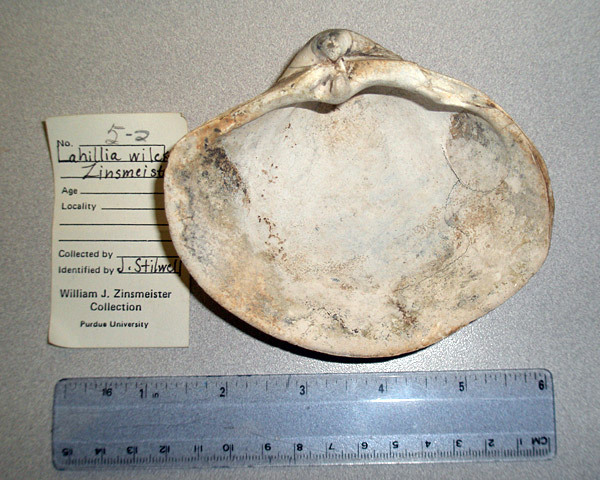 We can read this and many other aspects of ecology and anatomy from fossil bivalves. 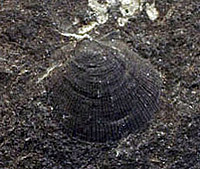 Fossil Disk Clam, Dosinia concentricus. 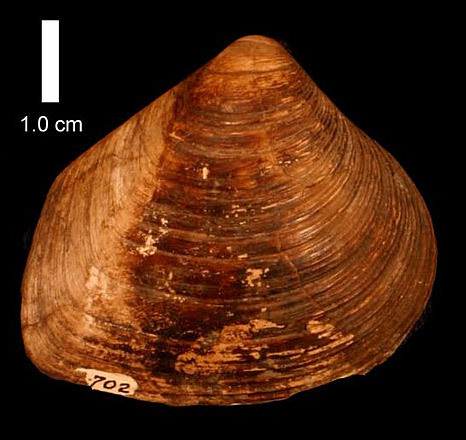 23 - today Marine bivalve communities are relatively stable. Many species, from as early as the Miocene Epoch (early Neogene), survive to the present. 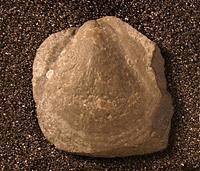 Eocene heart cockle from Antarctica. The Eocene Epoch, in the mid-Paleogene (56-34 Ma), is very different from the modern world. Globally, it is a very warm “hothouse” world — the air temperature difference from the pole to the equator is only half of today's and the deep ocean currents are exceptionally warm. Tropical climates extend as far north as Maine and Hokkaido, Japan. There are no polar ice caps, India is free-floating, and Eurasia is all askew, but the modern continents are recognizable. Heart cockles (family Cardiidae), now largely restricted to the tropics, live in what is now Antarctica. 145 - 65 Rudists are major reef-builders during the Cretaceous Period, especially in the Tethys Sea, an ancient ocean more or less where the Indian Ocean is today. Rudists go extinct during the mass extinction that defines the Cretaceous-Paleogene boundary (formerly called the K-T Mass Extinction). 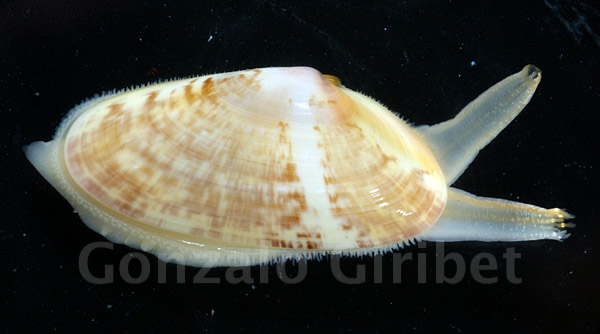 Living clam with siphons, Capsella variegata. New predators — starfish, crabs, and carnivorous snails — force bivalves to evolve new ways to avoid being eaten. Innovations include shell spines to deter handling by predators and siphons to allow burrowing deep below the sediment surface. 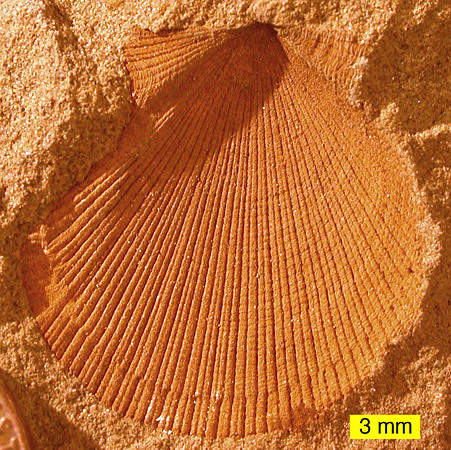 Swimming scallops make their first appearance in the Triassic. 250 - 199 The End-Permian Mass Extinction opens up many new niches following the largest recorded extinction in Earth’s history. Rostroconchia is the only extinct class of mollusks. The bivalve-like rostroconchs went extinct at the end of the Permian. A member of the phylum Mollusca; also spelled mollusc (most especially in the United Kingdom). are very diverse in the Permian, but the period ends with the largest recorded mass extinction in Earth's history, driving 96% of all marine species and 59% of all bivalve genera into extinction. 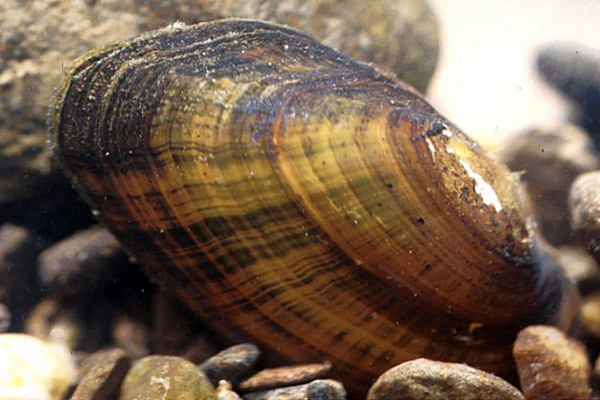 Living freshwater mussel, Alasmidonta raveneliana. 359 - 299 The Carboniferous is named for its coal deposits. Global temperatures are cooler, glaciers are plentiful, and sea levels are low. 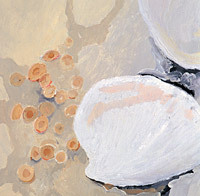 The first freshwater bivalves date from this period. 416 - 359 The Devonian sees a continued warm climate worldwide, and high sea levels. 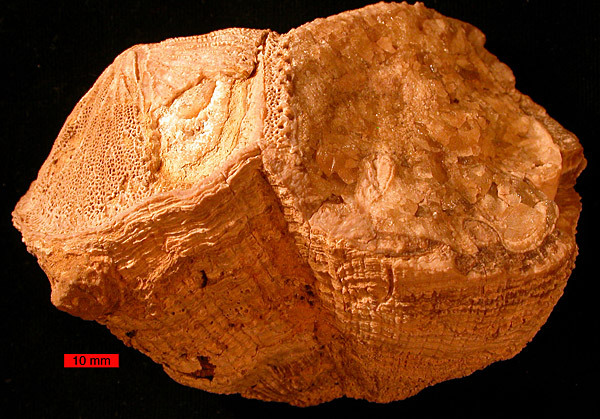 Silurian clam (Megalomoidea) and rugose coral (Acervularia). 443 - 416 The Silurian is a period of stabilization of the Earth's climate, melting glaciers, and rising sea levels on a worldwide scale. Coral reefs first appear, as do the first fishes with jaws. Living Zebra Mussel, Dreissena polymorpha. Bioturbators — especially trilobites and worms — dug into the sediment during the Cambrian and over time destroyed the microbial mats upon which early bivalves depended. By the Ordovician, bivalves are larger and more diverse. Innovations include the filter-feeding gill, the burrowing foot, and the byssus. Fordilla troyensis, from the Early Cambrian of New York State, is the earliest known bivalve, approximately 550 million years old. The earliest known bivalves are fully formed, with shells, hinges, and adductor muscles. Cambrian bivalves are marine, tiny, and live just at the sediment surface. 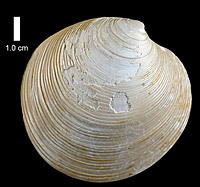 The two earliest species, Pojetaia and Fordilla, crawl and feed on microbial mats, similar to today's protobranch nut clams (Nucula). The earliest forms of multicellular life on Earth that still exist as fossils are from the Ediacarian Period, immediately preceding the Cambrian. Bivalves must have evolved during this time, but we do not (yet) have any physical evidence of them.